How wonderful to come home and find those cool sheets waiting for you in the bedroom. To slip out of your clothes and take a hot bath, allowing the tension from the traffic on the way home or work to slip away from your shoulders as you relax in the hot water? How wonderful is it to read a magazine and enjoy the quiet of your bedroom? In this book of ideas, we will give you some amazing suggestions for your bedroom. 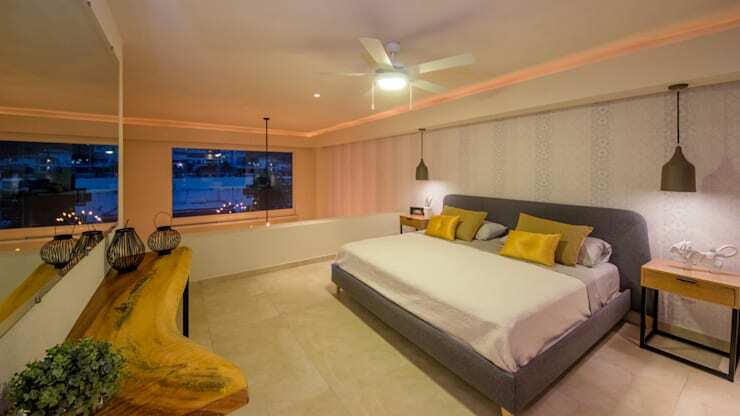 This is a special space and we want you to find a way to create a bedroom that is relaxing and comfortable without losing the appeal of trendy and stylish design that you can show off to anyone. 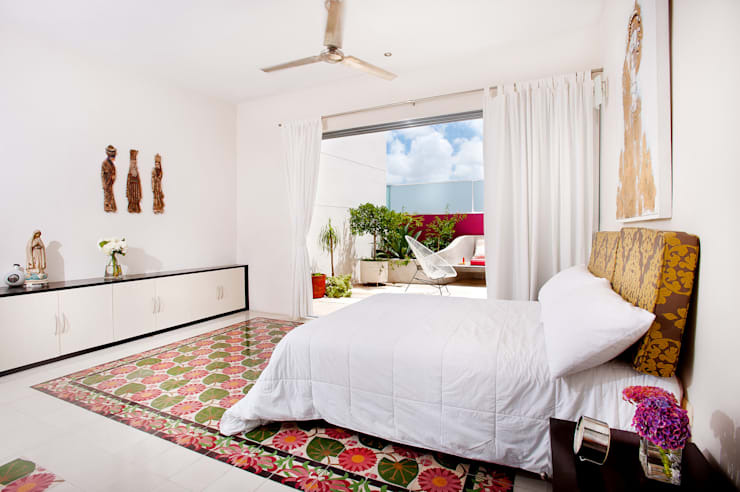 The size of the bed in your bedroom should depend on the size of your bedroom, which is very important. The bed should be positioned against a wall and if possible, should face or run parallel to a window or sliding doors, as seen in this photograph. Try not to have the bed positioned against windows as it will make the bed area incredibly hot during summer as the sun streams in through the windows and it may prohibit the curtains from closing. The dimensions of the bed must also be adequate for the people who are using it, because the length is important. In many shops, the display beds can seem very short compared to the average height of a person. Make sure that you get a bed that is long enough so that you are truly comfortable in it. According to studies that have been conducted, colour can have a profound effect on our moods. We recommend a relaxing turquoise colour for your bedroom as this colour is said to provoke freshness and calm. Don't you love this turquoise bedroom by Rosa Pura Home Store? Blue in general is a good colour for calm, peace and relaxation. It is not recommended for people who suffer from depression, however, as it can enhance these feelings. Indigo, violet and purple can also promote relaxation and are good colours for people who suffer from anxiety, migraines and stress. So give your bedroom a face lift with these complementary colours, guarenteeing you peace and relaxation. Some people don't like the thought of plants in their bedroom due to the fact that they take in oxygen at night and release carbon dioxide, which is not good for us humans who need plenty of oxygen. This theory has been around for many years and originates from a scientist who claimed that plants were not good for humans to have in their bedrooms at night. Today, this theory is not valid. While it is true that plants emit carbon dioxide at night, it is in very small amounts. The benefits that they give us far outweigh this. Plants can add beauty and vitality to the whole house. If you do not like them next your bed, place them on a balcony or terrace so that you can enjoy their beauty and wonder. Curtains are a detail that cannot be missed! If you like to sleep in a very dark bedroom, then heavy and dark curtains are the answer. These are very modern, creating absolute darkness in the bedroom so that when they are shut, it seems like night time. This is pure bliss if you want to sleep in late on the weekends! If you opt for these curtains, make sure that they work with the style in the rest of your home. They should not clash with the beauty and design in the other rooms. Don't you like these curtains by Olivia Aldrete Haas? Banish television from the bedroom if you just want to relax and leave behind the cares of the day. It is true that the television is very cool, but listening to news programmes with bad news from around the world can sometimes be stressful when we hear about it too much. Leave the TV for the living room or another part of the house so that the bedroom remains a relaxing haven of peace and tranquility. Without television, you will instead seek the company of a good book or a magazine, which will put you at ease and allow your bedroom to remain peaceful and quiet. 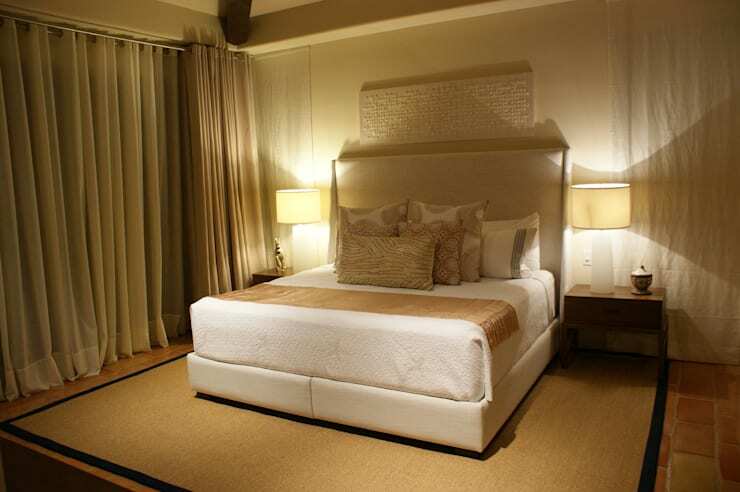 Lighting in a bedroom should leave the room in a soft glow, creating a relaxed feeling. Sunlight should not directly hit you in the face in the morning and lights should be in the form of lamps or on the headboard. If you have a light on the ceiling, it shouldn't be too bright. Lamps on the bedside tables are also important, for reading while in bed. This creates a very warm and cosy environment. If you're looking for more inspiration, you might like to learn: How Colours Influence Your Bedroom. How have you made your bedroom warm and comfortable? Did we leave anything out? Let us know!